A Ball of a Time! 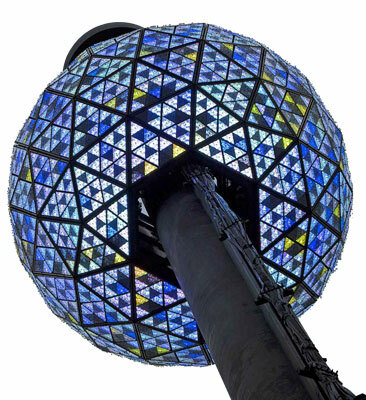 For 110 years at midnight on New Year’s Eve, a billion people stop what they are doing in order to watch the crystal ball in Times Square, New York City, slide down a pole. The actual ball up close is beautiful: an aluminum, geodesic skeleton covered in wedge-cut crystals and more than thirty-two thousand light-emitting diodes. The ball is also capable of creating billions of kaleidoscopic color patterns. What most people may not know is that the ball was originally inspired by a “time ball”. It had nothing to do with New Year’s Eve! Time balls originated in the early 1800s before there were time zones. Cities in North America kept their own time, based on the sun. But knowing the exact time was especially difficult at sea. Eventually, someone came up with an idea to help ship captains keep time. They erected “time balls” on shore, five feet in diameter, one on top of a flagpole, and one that was mobile. At noon, as one ball was raised and passed the other, from way out at sea you could spot the light shining between the balls and thereby, know the official time. Long after ship captains had found a better way to tell time, cities kept their “time balls” as curiosities. Although you could tell time by them, they eventually became decorative elements on top of buildings, or displayed above jewelry stores that sold watches. At various times, the ball in Times Square has been replaced. The ball we see drop now was installed in 2009. It’s 12-feet in diameter, weights 12,000-pounds – double the size of previous balls! 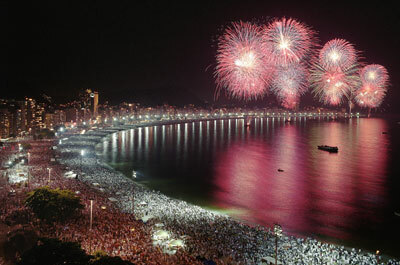 Brazil, South America – New Year in Brazil is known as Ano Novo (Portuguese) but is more popularly called Réveillon. In Rio, the shores are lined with over 2 million who usually wear white as a tradition and have a fabulous celebration by the beach. Austria, Europe – The 31st of December is the day of Saint Sylvester – therefore, Austrians refer to New Year’s Eve as “Silvester”. Bleigießen is a New Year’s tradition, in which people take small pieces of lead in “lucky” shapes – pigs, shamrock, horseshoes – and melt them to see their future. Cape Town, South Africa – Every New Year’s Eve, there’s an annual event called the Cape Town Minstrel Carnival. There are minstrel troupe songs, dancing, and costume parades where people dress up in bold silk fabric, ties, umbrellas and hats. Australia – New Year’s Eve dancing balls are popular around the country. Dressing up in costumes is popular, so there are various themes such as masquerade, black-tie and formal wear, tropical, or gangster and glamour. Singapore, Asia – Singapore’s Siloso Beach Party claims to be the largest New Year’s outdoor beach celebration in the world. It includes a big dance floor, a foam pool, and top DJs spinning the best tunes as party goers dance their way into 2018.